Policy for being listed on Planet PostgreSQL. Add your blog to Planet PostgreSQL. List of all subscribed blogs. Get in touch with the Planet PostgreSQL administrators at planet at postgresql.org. In the famous fairy tale the hedgehog wins the race against the hare because he uses his brain to outwit the much faster hare: Brain beats muscle. But is that always the case? And what if we combine the two virtues? The case at hand: Screening large sets of molecules for chemical simliarity. Since (sub)graph isomorphism searching faces some mathematical challenges because of nonpolynomial O - even if you can use a specialized index, like pgchem::tigress does - fast similarity searching based on binary fingerprints has gained popularity in recent years. I was tasked with evaluating a solution to the problem of similarity screening large sets of molecules with PostgreSQL where the fingerprints are generated externally, e.g. with the CDK. Above is the table definition of the final table. The cardinality column will be not used now, but since it is calculated by the fingerprint generator anyway, keeping it will save some work later. If you want to copy my example code 1:1, please use a database named chemistry and a schema named cdk. First we need to load some data into the table. I used the free NCISMA99 dataset from the National Cancer Institute, containing 249081 chemical structures in SMILES notation. And a few seconds later you should have 249081 rows in the table. Now we need to generate the fingerprints. The generator code is here, additionally you need the CDK 2.2 and a PostgreSQL JDBC driver. After changing the code to reflect your JDBC URL you are good to go. Running the FingerprintGenerator should show no errors and takes about 30 Minutes on my Core i5 Linux Notebook. The fingerprint used is the PubChem fingerprint as described here. Yesterday I released next version of plpgsql_check. Added in PostgreSQL 9.3, data checksums can help to detect data corruption happening on the storage side. Checksums are only enabled if the instance was setup using initdb --data-checksums (which isn’t the default behavior), or if activated afterwards with the new pg_checksums tool also added in PostgreSQL 12. When enabled, checksums are written each time a block is written to disk, and verified each time a block is read from disk (or from the operating system cache). If the checksum verification fails, an error is reported in the logs. If the block was read by a backend, the query will obviously fails, but if the block was read by a BASE_BACKUP operation (such as pg_basebackup), the command will continue its processing . While data checkums will only catch a subset of possible problems, they still have some values, especially if you don’t trust your storage reliability. Up to PostgreSQL 11, any checksum validation error could only be found by looking into the logs, which clearly isn’t convenient if you want to monitor such error. detects a checksum failure are counted. On 3rd of April 2019, Alvaro Herrera committed patch: Log all statements from a sample of transactions This is useful to obtain a view of the different transaction types in an application, regardless of the durations of the statements each runs. Author: Adrien Nayrat Commit message makes it pretty clear, so let's see … Continue reading "Waiting for PostgreSQL 12 – Log all statements from a sample of transactions"
On 2nd of April 2019, Alvaro Herrera committed patch: Report progress of CREATE INDEX operations This uses the progress reporting infrastructure added by , adding support for CREATE INDEX and CREATE INDEX CONCURRENTLY. There are two pieces to this: one is index-AM-agnostic, and the other is AM-specific. The latter is fairly elaborate … Continue reading "Waiting for PostgreSQL 12 – Report progress of CREATE INDEX operations"
On 30th of March 2019, Peter Eisentraut committed patch: Generated columns This is an SQL-standard feature that allows creating columns that are computed from expressions rather than assigned, similar to a view or materialized view but on a column basis. This implements one kind of generated column: stored (computed on write). Another kind, … Continue reading "Waiting for PostgreSQL 12 – Generated columns"
PostgreSQL has a very unique way to review the code submitted by developers. Most open source software uses Github pull requests to accommodate users’ code. PostgreSQL has a Github page but doesn’t manage pull requests using Github. Many years ago, PostgreSQL introduced CommitFest to manage its patches, where postgres opens for a three to four month “festival” to accept patches. The CommitFest is set up to keep track of patches’ statuses. In practice, CommitFest is mainly an admin page used to manage patches. Volunteers and community committers review the submitted code, after which committers are able commit those patches that have been approved. There have been almost 22 CommitFest events since 2014. Needs review indicates that the patch is waiting for a reviewer to analyze it. Once a reviewer has confirmed that the patch in question is good to be committed, a community committer will pick up the patch, review it and commit it if all is well, otherwise, they reject it or return it with feedback. A complete history of a patch, along with a discussion on email, is maintained with each revision which makes it very simple to track the complete process from submission of a patch to its eventual conclusion. Here are some graphs that show various stats for the past CommitFests. The other day, I remembered an old 9.0-era mail thread (when Streaming Replication had just launched) where someone had tried to daisy-chain Postgres Replicas and see how many (s)he could muster. If I recall correctly, the OP could squeeze only ~120 or so, mostly because the Laptop memory gave way (and not really because of an engine limitation). I couldn't find that post, but it was intriguing to know if we could reach (at least) a thousand mark and see what kind of "Replica Lag" would that entail; thus NReplicas. On a (very) unscientific test, my 4-Core 16G machine can spin-up a 1000 Replicas in ~8m (and tear them down in another ~2m). Now am sure this could get better, but am not complaining since this was a breeze to setup (in that it just worked without much tinkering ... besides lowering shared_buffers). For those interested, a single UPDATE on the master, could (nearly consistently) be seen on the last Replica in less than half a second, with top showing 65% CPU idle (and 3.5 on the 1-min CPU metric) during a ~15 minute test. So although (I hope) this isn't a real-world use-case, I still am impressed that without much tweaking, we're way under the 1 second mark, and that's right out of the box. Am sure there's more to squeeze here, but still felt this was worthy of a small post nonetheless! I proposed a talk about pgenv, a Bash tool to manage several PostgreSQL instances on the same local machine. My talk has been rejected, and I hate to waste what I have already prepared, so I decided to transform my talk in an article, that has been quickly accepted on Haikin9 Devops Issue! I should have written about this a couple of months ago, but I did not had time to. My hope is that pgenv gets more and more users, so that it can grow and become someday a widely used tool. Quite frankly, I don’t see this happening while being in Bash, for both portability and flexibility, and I suspect Perl is much more the language for a more flexible implementation. However, who knows? Gathering users is also a way to gather contributors and bring therefore new ideas to this small but very useful project. In the meantime, if you have time and will, try testing the build from git patch, that allows you to build and manage a development version of our beloved database. As of 15 April 2019, there is only one repository RPM per distro, and it includes repository information for all available PostgreSQL releases. This change, announced by Devrim on the pgsql-pkg-yum mailing list, has some impacts. The announce from Devrim may be found here. Instead of having separate repo RPMs per PostgreSQL major version, we now have one single repo RPM that supports all supported PostgreSQL releases. The new packages obsolete the current ones. The repo RPM version has been bumped to 42. Hopefully that will be the end of the “The repo RPM is 10-4, how can I find 10-7 repo rpm, so that I can install PostgreSQL 10.7?” type questions. The “latest” suffix has been added to all repo RPMs. Let’s see some impacts of those changes on CentOS 7. As usual, go to https://www.postgresql.org/download/linux/redhat/ and chose the version (11), the platform (CentOS 7) and the architecture (x86_64) you want to install. Today, you still get the link to the pgdg-centos11-11-2 rpm. The file named 16405 is the heap of our table, but what about the others? These are auxiliary files, called “relation forks” that contain additional information to help PostgreSQL access and maintain the table. 16405_fsm is the free space map. Its job is to know which pages in the table have space available for inserting records. 16405_vm is the visibility map. Its job is to know which heap pages may need VACUUM-ing or freezing, and also which heap pages must be visited during index-only scans. This gives us the path of the toast table for our table, as well as that of the toast table’s index. If we insert any records with large enough strings, they will be compressed and stored here. How much disk space do we need to store our one record? Native streaming replication in PostgreSQL works only between servers running the same major version. We discussed about logical replication in our previous blog post. In that post, we saw how logical replication could help us set up migration between two different PostgreSQL versions. However, logical replication works only for the currently supported versions of PostgreSQL, for example between PostgreSQL 9.4 and PostgreSQL 11. So what about the legacy versions that are older than 9.4? Slony-I could help us meet this replication requirement. Replication between different PostgreSQL versions with Slony-I is useful for migration from legacy database installations to the latest available version. So what is Slony and how does it work? This post is the fourth of our Upgrading or Migrating Your Legacy PostgreSQL to Newer PostgreSQL Versions series where we’ll be exploring different methods available to upgrade your PostgreSQL databases. Slony is an application-level logical replication implementation for PostgreSQL. Rather, we could say that it is an external replication tool that requires a separate installation and configuration. Slony has been around for a long time. The latest version supports PostgreSQL versions from 8.4 and up to 11. The main goal for replication is to ship changes from one database server to another. To better understand the architecture, you should know the terms such as Slon, Events and Slonik in Slony-I. An aside: Slony means elephants in Russian, and elephants are indeed reputed to have a great memory. A slightly angry, but nevertheless pretty elephant, “Slonik”, looks at you from the PostgreSQL logo image. 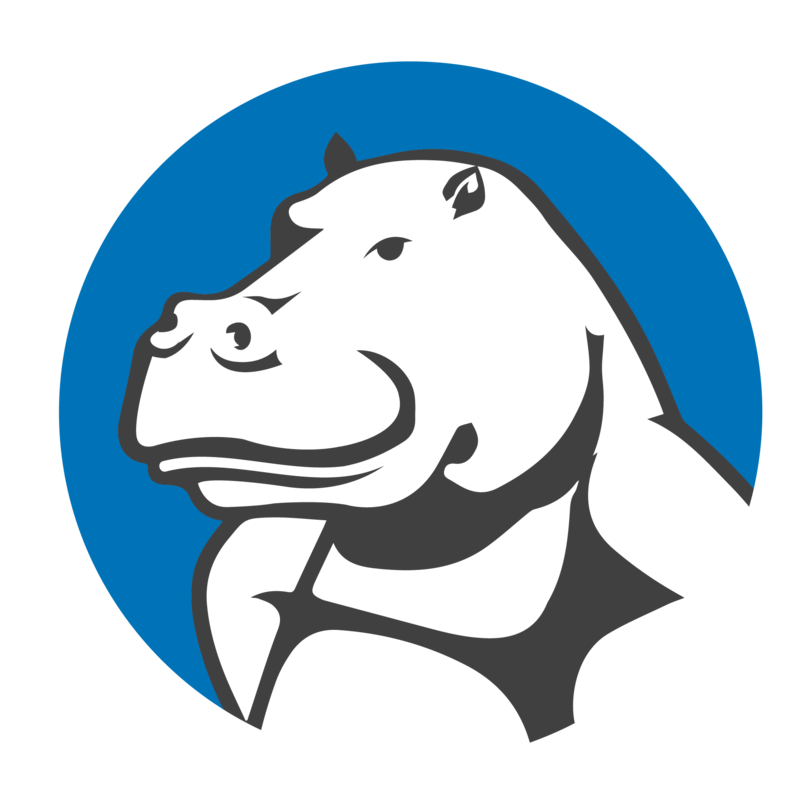 Slon is a daemon that runs on each PostgreSQL node in Slony-I replication. These daemons are used for processing configuration and replication events for each PostgreSQL server. Each PostgreSQL server is called a “node”. All nodes together form a Slony “cluster”. pg_checksums is a renaming of the tool called pg_verify_checksums which has been introduced in Postgres 11. Version 12 is introducing new options and possibilities which explain the renaming, as the tool has become much more multi-purpose. correct checksum, and updating the control file at the end. the default used if no mode is specified. (named pg_verify_checksums in v11 where it was introduced). –check, the default if nothing is specified and what pg_verify_checksums was already able to do. This mode scans all the relation file blocks, reporting any mismatch. –enable, which enables data checksums. This rewrites all the relation file blocks, and finishes the operation by updating the control file. Note that this can be take time depending on the size of the instance, and that the tool has no parallel mode. If you’ve visited almost any web page on the PostgreSQL Build Farm server in the last few days you might have noticed that it is sporting a new RSS feed, of changes in status. This is similar to the information on the buildfarm-status-green-chgs mailing list, except that it has all status changes, not just to and from green. This new feature fulfills a long outstanding request. PostgreSQL has been my livelihood since 2004 – so I am naturally biased in its favor. I think it is the coolest piece of software on the planet, and I am not alone. See those 2 badges up there? That’s 2 years in a row. DB-Engines monitors a total of 343 databases and their trends. 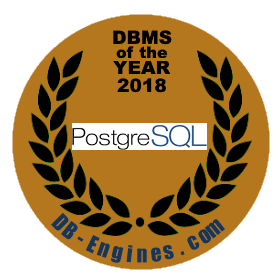 For each of 2017 and 2018, DB-Engines states that PostgreSQL gained more popularity in their rankings than any other database – hence the award. This is no small feat. DB-Engines has a complex methodology of calculating popularity including search engine queries, technical discussions on popular forums, related job offers, and social media trends. Coming out on top 2 years in a row shows how much technologists love Postgres. You Google for the solution of a problem you are facing. Chances are the first hit you are going to get will be a link from Stack Overflow. Millions of registered users interact hundreds of thousands of times every day answering questions, sharing knowledge, and making technology so much more easy to use for fellow enthusiasts. Stack Overflow runs a survey each year asking the developer community about their favorite technologies. Want to guess what I am driving at? That’s the result of over 100,000 technology enthusiasts from across the world coming together and loving PostgreSQL. Hacker news – run by Y Combinator, one of the top USA accelerators since 2005 – is another forum that brings together technology enthusiasts from all around the world. The graph above posts trends over the past 8 years and compares popularity between MySQL, SQL Server, MongoDB, and our rising star – PostgreSQL. And just look at how it is rising! "When asked for a slice of a TOAST entry, decompress enough to return the slice instead of decompressing the entire object." I and Nikita Glukhov made a quick experiment to see how jsonb could get benefit from this commit. The idea is simple, let's short values (more valueable) stores before long one. Currently, access time is independent on key, but with support of partial decompression we can get benefit for front keys. Since jsonb stores values of keys in sorted (by key) order, we generate values depending on key name. Access time for non-optimized operator '->>' is the same for all keys and roughly is 2000 ms. So, this is what we can get for now. Ideally we want to have access time for all keys equal for time of accessing the first (fastest) key, currently we have the opposite. I hope TOAST will be improved and we could decompress any slice using data type specific algorithm. prune branches when doing git fetch. This feature and some server side changes will be explored in detail in my presentation at pgCon in Ottawa next month. The feature doesn’t affect owners of animals in our normal public Build Farm. However, the items below are of use to them. There are also various minor bug fixes and code improvements. When you need to upgrade PostgreSQL, there are a variety of approaches that you can use. To avoid application downtime, then not all of the options to upgrade postgres are suitable. When avoiding downtime is essential, then you might consider using replication as a means of upgrade, and depending on your scenario, you can choose to approach this task using either logical replication or physical (streaming) replication. Here, we take a look at the difference between logical and physical replication in PostgreSQL. Then we explore how to accomplish an upgrade using logical replication in more detail, and by doing so, avoid application downtime. In a subsequent article, we’ll investigate physical replication. We have already discussed about a few methods available to perform PostgreSQL upgrades in our previous blog posts – PostgreSQL Upgrade Using pg_dumpall and PostgreSQL Upgrade Using pg_dump/pg_restore – as part of our Upgrading or Migrating Your Legacy PostgreSQL to Newer PostgreSQL Versions series. However, both of these methods involve downtime to application. Replication between PostgreSQL 10 and 11 versions using built-in logical replication. Replication between PostgreSQL 9.4 or (< PG 11) to PostgreSQL 11 using an extension named pglogical . We might opt to implement replication as a method of upgrade to minimize downtime for the application. Once all the data to date has been replicated to another PostgreSQL server on the latest version, you can simply switch your application to the new server with a minimal downtime… though of course this does depends on the complexity of your application stack. A few days ago a CVE was announced for Postgres. To say this CVE is a bit overblown is an understatement. The first thing to know is you’re likely completely safe. If you run on a managed service provider you are not going to be affected by this, and if you’re managing your own Postgres database all chances are you are equally as safe. This CVE received a note from Tom Lane on the pgsql-announce mailing list in response to it getting a broad amount of awareness and attention. But, we thought this might be a good time to talk about a few principles and concepts that underly how Postgres works. For quick context the CVE states that the copy program within Postgres when run as super user will allow arbitrary code execution. The copy program within Postgres is a great tool for bulk loading of data. The utility essentially loads data to/from disk. Shifting to the Postgres super user… Postgres is an extremely powerful database, well really it is more of a data platform. As super user you can perform all types of powerful operations. Those can include things that touch the underlying system itself, or enabling extensions which allow for low level system access. These types of operations should always be treated with care an caution. If you’re handing out superuser access to your database or connecting to your application with a superuser role, consider changing that immediately. It is a frequent complaint that count(*) is so slow on PostgreSQL. In this article I want to explore the options you have get your result as fast as possible. Why is count(*) so slow? After all, it is a complicated query, and PostgreSQL has to calculate the result before it knows how many rows it will contain. Yet if you think again, the above still holds true: PostgreSQL has to calculate the result set before it can count it. Since there is no “magical row count” stored in a table (like it is in MySQL’s MyISAM), the only way to count the rows is to go through them. So count(*) will normally perform a sequential scan of the table, which can be quite expensive. Is the “*” in count(*) the problem? The “*” in SELECT * FROM ... is expanded to all columns. 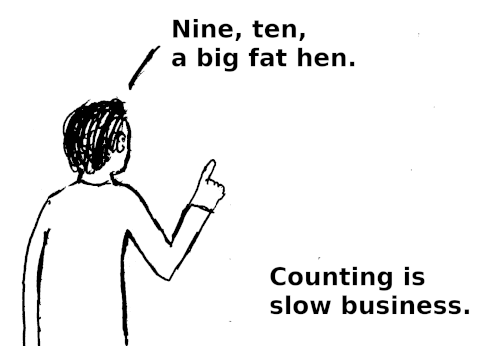 Consequently, many people think that using count(*) is inefficient and should be written count(id) or count(1) instead. But the “*” in count(*) is quite different, it just means “row” and is not expanded at all. Writing count(1) is the same as count(*), but count(id) is something different: It will only count the rows where id IS NOT NULL, since most aggregates ignore NULL values. So there is nothing to be gained by avoiding the “*”. It is tempting to scan a small index rather then the whole table to count the number of rows. However, this is not so simple in PostgreSQL because of its multi-version concurrency control strategy. Each row version (“tuple”) contains the information to which database snapshot it is visible. But this information is not (redundantly) stored in the indexes. So it usually isn’t enough to count the entries in an index, because PostgreSQL has to visit the table entry (“heap tuple”) to make sure an index entry is visible. Recently, references to a "new PostgreSQL vulnerability" has been circling on social media (and maybe elsewhere). It's even got it's own CVE entry. The origin appears to be a blogpost from Trustwave.